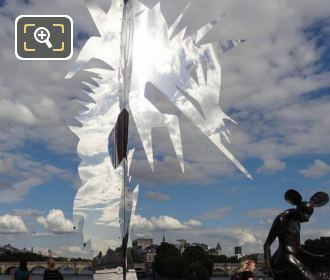 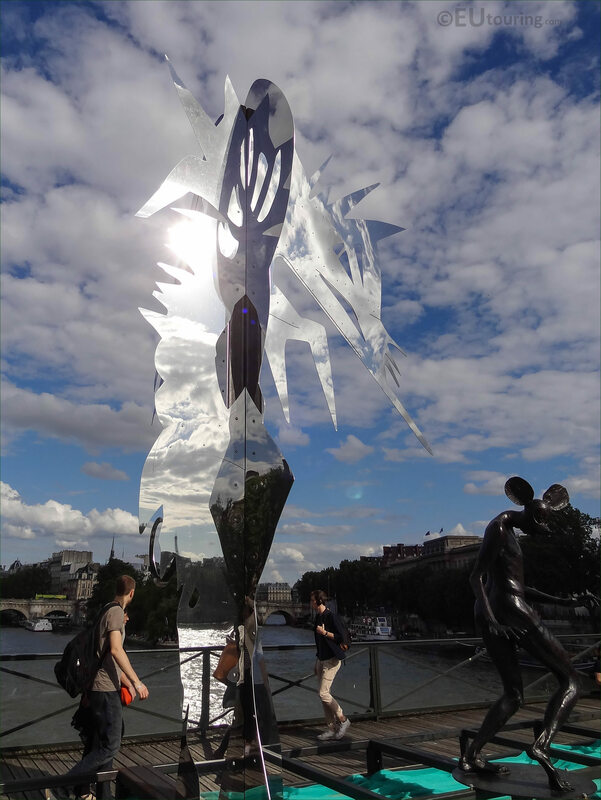 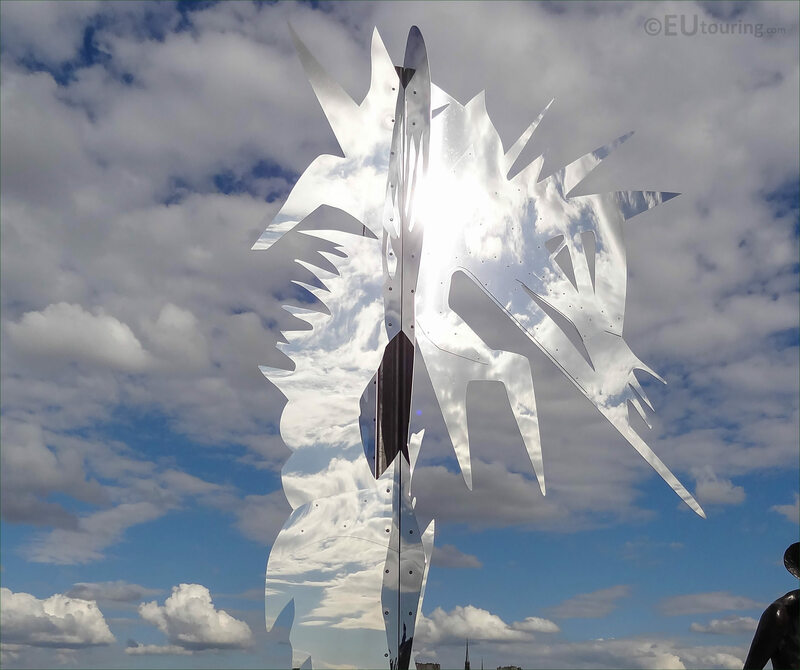 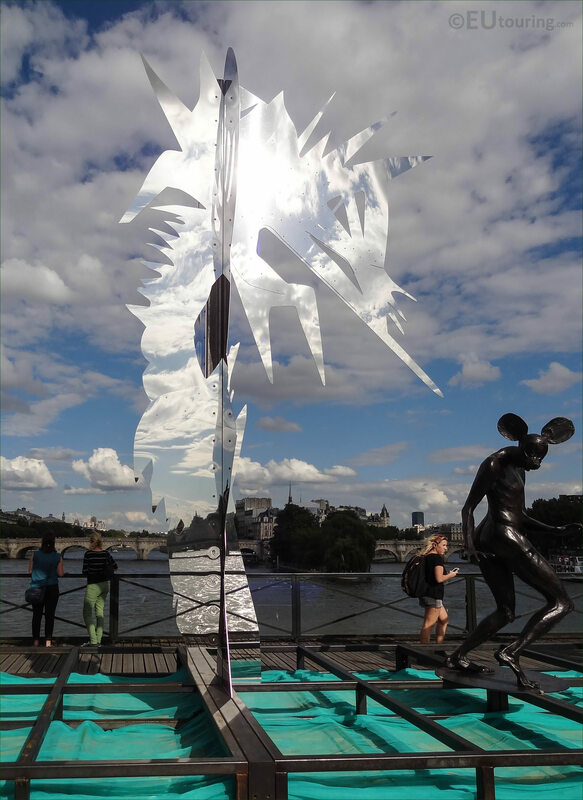 We took these high definition photos showing a sculpture called Arbre VII mirror by Daniel Hourde, which is part of an art exhibition called La Passerelle enchantee, that is located on the Pont des Arts in Paris. The pedestrian bridge called the Pont des Arts used to hold temporary art exhibitions, but then became referred to as the Bridge of Love and millions of people added padlocks to the railings, but this became too dangerous due to their weight, so the City of Paris decided to remove these and change it back to one of art combined with romance. 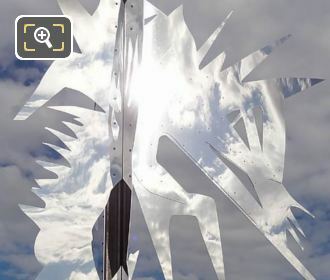 Incorporating steel into the sculptures and statues, like you can see here with this close up showing the top part of the Arbre VII, or Tree 7, reflecting with the sun and clouds, the temporary art exhibition by Daniel Hourde was designed to be a transition from just romance, and getting the Pont des Arts recognised again for what its name means. 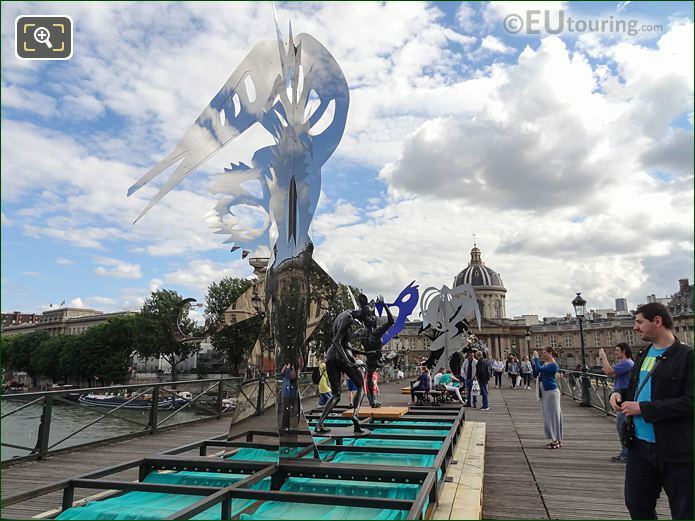 Daniel Hourde utilised ten trees within the temporary installation, referring back to when the Pont des Arts was meant to be a suspended garden and a promenade area for lovers, yet he also utilised steel, as a reminder of love, but without the padlocks that caused the bridge to become weakened and dangerous. 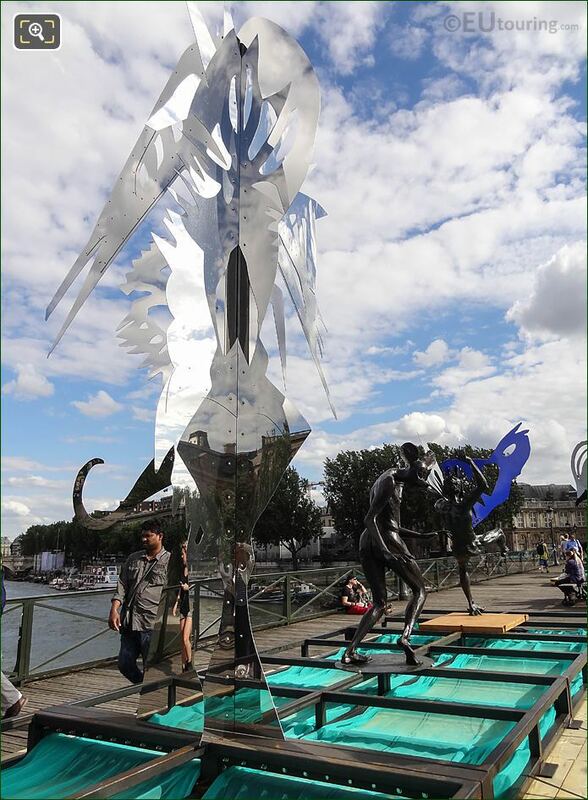 So here you can see l'Arbre VII positioned on one of the temporary platforms next to other statues that were also designed by Daniel Hourde, which runs in conjunction with a solo exhibition being hosted at the Galerie Agnes Monplaisir in Paris, and this entire temporary installation is called La Passerelle Enchantee. 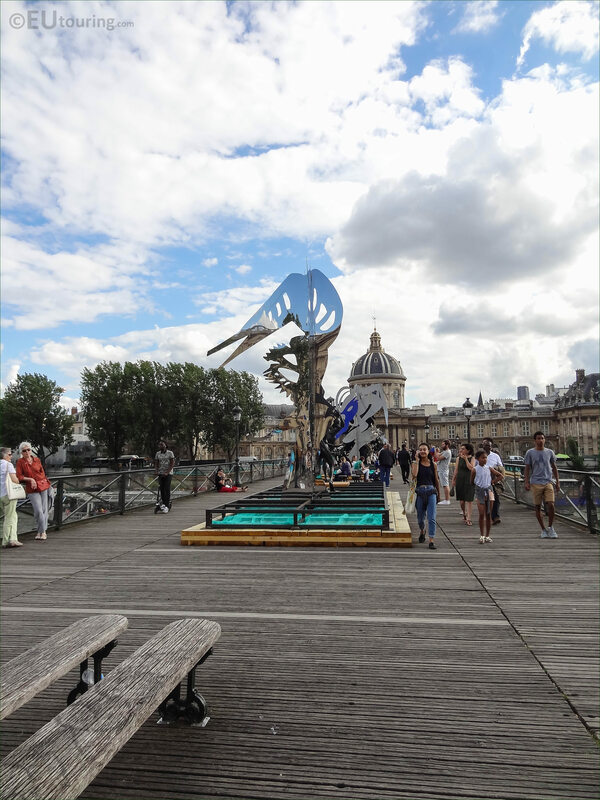 La Passerelle Enchantee, which in English translates to The Enchanted Footbridge incorporates myth and magic into the compositions by Daniel Hourde who was born in 1947 and studied at the Ecole des Beaux Arts in Paris, yet has exhibited, not just in this city, but in many other places throughout the world, such as Brazil, Germany, Russia, etc. And the founder of the Galerie who represents Daniel Hourde, Agnes Monplaisir was also instrumental in making this temporary exhibition of The Enchanted Footbridge happen, which was like a dream come true for her, to be involved in a symbol of love and art on the historical Pont des Arts.